Do you qualify for Diamond level membership? Diamond level membership is reserved for EzineArticles highest caliber of Expert Authors. Only a very small percentage of authors make it to this level based on their consistent quality article submissions and more eligibility requirements. We’ve broken it down so you too can achieve Diamond level membership. What are the benefits of being an EzineArticles Diamond Expert Author? 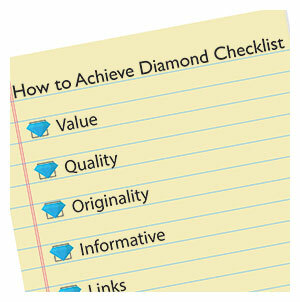 Use this eligibility checklist to become a Diamond Level Member! Need help with any of the above check points? Our Member Support team is ready to help you become a stronger, better author by helping you pinpoint problematic areas in your articles. Select Contact Us from your account to contact Support. Can you lose your Diamond status? Yes; one of the most common issues for members who lose their Diamond status is failing to proofread their articles for grammar and spelling errors. The key to achieving and keeping your Diamond level membership is consistency in quality and originality. Do you think you’re ready to become a Diamond Expert Author? Log into your My.EzineArticles.com account. Select your account’s member name dropdown menu from the upper-right corner of the screen. View the list of qualifications; if you currently don’t qualify, a list detailing how you can enhance your eligibility will appear. When all of your eligibility requirements have been met, a “Request Diamond Membership Level” field will appear; enter your request. Want more information about EzineArticles Membership levels? Get an Upgrade: A Fresh Look at EzineArticles Membership Levels. Diamond level authorship is something that everybody would aspire to acquire however not achieved by all. Submission of high quality article require consistent efforts and time. How many Authors out of total members have qualified under Diamond category? The answer will prove the point of this article. Well done! The rules for becoming a Diamond category article writer are clearly spelt out. Every writer’s dream is to get to the topmost notch. Since there is a benefit attached (like having minimum article words reduced to 250), it’s worth gunning for as a prolific writer. I have reviewed your account and your articles. Nice job! Congratulations, you have earned a Diamond level membership. Keep up the great work. I love this continual input and constant encouragement from the EzineArticles team. They go about the business of gently prodding, pushing and motivating one to keep on delivering the good stuff in return for a constant stream of quality visitors, a win win if there ever was. On the other hand…should I reject this article on the pretext of that ginormous spelling error it contains or should I remain constantly aware of the fact it was written and reviewed by fallible humans? May I know the number of Diamond Authots at present! Thanks for the diamond information. Is there any spell and grammar check software available .Because, on many occasions I find difficult to diagnose my articles owing to the time constraint and also several articles I write in a week. Just to ensure my article is of quality content and meets the reading standards, I don’t submit for approval. Can you suggest any measure to help me . This is a interesting that how to become diamond level membership and how to approach it, needs more attention and work for this goal. Thanks so much for the wonderful Job, keep it up. I pray that God should grant you more wisdom, knowledge and understanding to do more. There will be innumerable number of people who will be over qualified for diamond authorship if only you apply your criteria fairly and uniformly across the board. Though as an independent entity you have the right to make your own rules and regulations for people who use your services.. While I respect you rules and regulations I have a lot of reservations concerning some of the rules and your sincerity in implementing your own rules. ii. You talk of articles being transparent, I have no problem with authors writing genuine and transparent articles, that anyone can authenticate their veracity or otherwise . Unfortunately in the recent time I am beginning to question the transparency of EzineArticles in implementing their own rules. a. An author who published 11 articles is awarded diamond authorship and not the author who published 14 articles. You wonder what is the standard? According to your own rules and regulation you are supposed to highlight the section (s) of the article(s) that are in violation of the grammatical requirements, but you never do that rather you simply send back the article. In professional journals when editorial board read through articles and detect errors of any kind, they do not not simply reject the article or just send the article to the author, they send back the article stating the sections/ paragraphs or lines that need to be reviewed. They do not leave the author in the dark looking through the article wondering the section that needs to be reviewed. i. We ask members to upload a picture as it helps build their credibility as an author. Think about it, when you go to search for information online and you read an article, do you trust the source even more when you are able to see the author’s name and their photo? By being transparent with your readers you help build their trust in you and what you have to say as a credible source of information. ii. a. It doesn’t always matter how many articles an author publishes. We don’t award membership levels based on the amount of articles that are live. We base upgrades on the quality of the information that is submitted. If there are no errors in an author’s work they will receive an upgrade quickly vs. someone who has submitted many articles but has issues along the way. ii. b. Rest assured all of our editors are well versed in the English language. In fact, most of them have degrees that are focused in this area. A member of our Support Team will be in contact with you privately regarding your problematic articles in order to explain the issues further. iii. We maintain the highest quality standard and hold ourselves to this standard at all times. Of course, we are always searching for ways to improve so we thank you for your candor and suggestions. Regarding the links in question, we apologize if there was an error. This was addressed and corrected. This April 2013 is my 4th year with EzineArticles.com. Hope to write more articles! Thanks. A blessed day to staff and everyone! Need more attention, analyze and leanings such a topic which you are posting here and full heart work to achieve diamond level membership . I think that it is an interesting process way of achieving, i want to comparison this diamond level membership and trying how to achieve at a high mountain peak, when you are going up on a peak the way is so difficult but when you be at the top of the peak you are happy then, because you make realize your goal, so need only wish and work for everything which you want to make. We are unable to recommend a software program that will assist you with spelling and grammar. We can however, recommend that you hire a proofreader to review your articles for you prior to submission. Having a second set of eyes review our work is valuable in picking up small errors we may skim over ourselves. Thanks Vanessa for the guidance. I have posted 10 articles now. I am waiting on them to be approved. :) I do hope I qualify for this membership status. I think it would make a great accomplishment with my membership on this site. I wanted to know how possible is it to become Diamond with 11 articles, I have seen that people are doing what does it take for that to happen, it’s doable obviously but what does it entail? Can all 11 be submitted at the same time? Each member starts out with a Basic account which includes 10 submissions. If they are well-written and there are no issues found in these articles, and all of their Bio information is filled out, there is a great chance that when their account is reviewed for a possible upgrade they will receive Diamond status. Pretty! This was ann extremely wonderful post. Many thanjs for supplying these details.